In his "History of Nottinghamshire," Dr. A.C. Wood points out that "in the Tudor period the chief emphasis had been on the provision of grammar schools in the towns. Now in the seventeenth century, the attention of benefactors was turned rather to the establishment of elementary schools in which the poor might learn to read and write. The great age of the free or charity school came in the eighteenth century. By 1800 there were schools for this purpose in 66 parishes in the county." These are the first direct references to a charity school in the village, and from then on there are regular half-yearly payments of £5 to Vasin, or Vason, for the school or half year's salary to the Schoolmaster. "The sum of £10 per annum is paid half-yearly to a schoolmaster for teaching 12 poor boys and girls reading and writing. He is assisted by his wife who teaches the girls knitting and sewing. These children are appointed by the minister and churchwardens." Bartholomew Howlett's engraving of Views in Winthorpe in 1807 shows the School House (the house at the junction of Holme Lane and Gainsborough Road, now occupied by Mr. J. Wenn and now called The Dial House,) so the charity school was already in existence some years before the direct reference to it in the charity accounts. The half-yearly payments continue through the 1830's, with a change of schoolmaster, Wilkinson, in 1831, and Wm. North, Schoolmaster in 1832. However, after 1833 there is a gap of four years with no mention of payment to a school or schoolmaster until 1837 Oct. 6. Donation to the School £5.0.0. After this the payments continue "for the school" or Mr. Handley for the School (1839). This was the Rev. William Handley who was rector from 1836-1873; it does not mean that he was necessarily the schoolmaster, but only that he made the payment. The school may by this time have enlarged its scope to become a Parochial or a Dame school open to any child whose parents could afford to pay a few pence per week, in addition to the children still supported by the charity. In 1854, in a document addressed to the Charity Commissioners, the Rector and Churchwardens, after describing the present extent of the charity property, add "or many years the Rector and Churchwardens have expended rents from the land partly in purchase of Coals for the Poor the other part in aid of a Fund annually raise by subscription in support of a Parish School." The trustees asked the Commissioners if they might continue to support the school by a sum not exceeding £20 per annum and to this and other requests the Charity Commissioners agreed. and from this date the £5 half-yearly was paid to the Sunday School intermittently until the nineties. The early logbooks of Winthorpe School have not been traced, but from 1897 to the present day there is a full and interesting - in parts highly entertaining - record of both children and teachers. First the teachers. Here it is interesting to notice that, after the name of James Alien, the teacher in the Parochial School in 1861, no other man's name appears until the appoint­ment of Mr. R.K. Ellis in 1961, although the list of teachers at Winthorpe which accompanies this account may not be complete. In most years there was a head teacher and an assistant teacher. Throughout most of the nineteenth century very few teachers were trained - in fact the chief qualif­ication was that a teacher should be over eighteen, vaccinated and a Christian, and promotion was dependent on reports from H.M.I's. The almost obsessive anxiety shown in the log books about accuracy in the attendance registers can be readily understood when it is realised that the head teacher's salary was partly dependent on a high attendance. Consequently many holidays were granted when it was expected that there would be a low attendance, and if for any reason only a few children turned up, school was hastily closed so that the average should not fall. 1879. Jan.25. Attendance this week considerably fallen off in consequence of heavy snowfall. 1898. July.18. Langford and Winthorpe Wesleyan School Treat and a holiday will be therefore be given as the greater part of the children will be away. - I find the children extremely backward .... The chief point throughout the school is the lack of brightness and intelligence and particularly politeness. - Having examined the children I found them exceedingly backward in arithmetic. - It was impossible to find anything or know what was in the school, for cupboards and drawers were in a state of chaos. However, in every case a remarkable improvement is recorded over the following months. With regard to the children, the illnesses and epidemics, which ran through the school from time to time, were much the same as today, with the addition of more unusual cases of rheumatism, rheumatic fever or St. Vitus's dance. Sore throats and "fevers" were often recorded, probably the result of poor drainage in the village as a whole. In 1905, we read, "A gentleman came to examine premises in view of putting in the water supply pipes as the school water has been condemned." After this was done we read less often the sad little entries recording the deaths of quite small children. In the short space of two months at the end of 1899 and beginning of 1900, three children died of the throat complaint or fever so prevalent in the neighbourhood. However, the most surprising thing we notice in the log book for the early years is the number of times individual children were kept away from school to help in the fields (some­times for as long as three weeks in haytime or harvest), or to help their mothers at home. On other occasions the excuse was "two boys being engaged to pick up tennis balls," "Gone to Collingham Ploughing Match," or "Gone to Besthorpe for the day with her aunt from Wales." The teachers and attendance officers were constantly reprimanding children and parents about absenteeism, but their task was obviously a difficult one. 1898 Dec: The Vicar of Langford visited the school, bringing sweets to distribute for Christmas. 1899 Jan: Mrs. Tyndall called to complain of the ill-treatment received by her child from Oswald Pratt. 1900 April: Report by new head teacher "The children are very loveable but painfully shy." Nov: Have been obliged to punish the elder boys for rough behaviour during playtime. 1904 June: Dismissed 10 minutes earlier this afternoon to permit children to reach home in safety before the thunderstorm. 1905 Feb: Taught infants a new recitation "Freddie and the Cherry Tree" and the first verse of a new poem "Our Baby Boy" with actions. June: The children are using their new drill canes during the drill lessons. Sept: Have commenced breathing exercises also Physical Exercises according to the Ousterberg System. Nov: Lessons were shortened this afternoon in order that the children might watch an instructive demonstration in paper folding and cutting. 1906 May: Today being Empire Day we have departed from the timetable in order to have lessons on Patriotism. 1909 Oct: I am closing at 3 p.m. to enable me to take the children to Newark to see Bostock & Wombwell's Menagerie for educational purposes. 1910 May: Took 10 children to Newark to hear Proclamation of George V.
Sept: Instead of play this afternoon I am going to take the children a short walk down the lane. Sept: The Nurse paid an unexpected visit to the school this afternoon and examined the heads of all the girls. 1911 Feb; Interval of thirty minutes to take children to see the meet of hounds at Winthorpe Hall. too great for the children to walk. Sept: A very bad storm came on all the girls and two little boys had very wet feet. Fires were lighted and boots and stockings taken off and dried. ridiculous manner .... An approaching thunderstorm was I think largely responsible for the trouble. This was a hot summer before the outbreak of World War 1. 1915 June: One of the windows in the north corridor was broken during the mid-day recess by a stone, thrown by a tiny boy from the road. July: As the thunder was very heavy and the lightning unusually vivid, the greater part of the time was spent in marching and other occupations of a distracting nature. 1916 July: The Infants went for a nature walk this afternoon. 1918 Sept: The Head Teacher was absent from School when Miss Gilstrap called to check the registers, owing to meeting with a bicycle accident on her way to school. 1921 April: As there was a solar eclipse this morning the ordinary routine of work was suspended in order that the children could make observation of the same. 1922 Feb: School did not meet today being the Wedding Day of Princess Mary. A tea was given to the children to celebrate the event. Now, open days are held every term, and an active and enthusiastic Parent-Teacher Association organises lively social and moneymaking efforts like Bonfire Parties, Tramp Suppers, etc. to raise money for special items of equipment for the school. 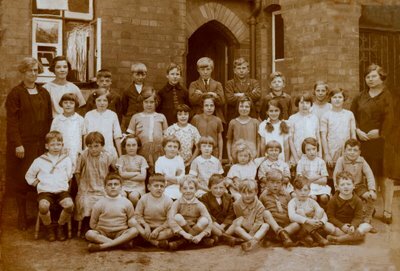 Until 1952 the school included children up to the age of 14 years, but it then became a Primary School only, and at the age of eleven the children move on to Secondary Modern schools or Grammar Schools. 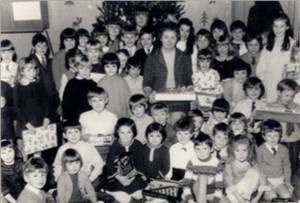 For many years in the sixties Winthorpe School was threatened with closure, and parents and school managers fought hard to retain it, believing strongly that a village school is an essential part of the village community. However, it was the building of two housing estates, with the prospect of a third, which decided the education authority to put in hand the building of a new school behind the old one, to accommodate the increasing number of children. This school is now going up, and it is hoped it will be completed in May this year, 1971. It is to have a 100-meal capacity kitchen, beautiful modern equipment everywhere, with ample room for every variety of school activity. It already has a large area for a playing field, which was put to good use in 1970 when Winthorpe School, hosts for the local inter-Primary School Sports, practically swept the board and won most of the major events. Unluckily, the early admission registers do not mention the occupations of the parents, but we can assume that these were mainly rural. The children now come from widely differing backgrounds, and many are not even natives of the village: there are children of service personnel who have lived abroad, children from many far-away parts of Britain, and at the moment, two American children. And nowadays the string of cars waiting at 3.30 p.m. to pick up the children underlines the difference in their way of life: no more walking long distances four times a day, no more occasions when fires have to be lit in school to dry off "wet boots and stockings," no afternoons when they have to be sent home early before a thunderstorm arrives. There are a few puzzles about schools in the village that we have not so far been able to solve. The house known as The Academy (now occupied by Mr. G. Bennett) was certainly a school in 1807, when Howlett's engraving was done. It may have been a little private school run by Mr. Henry Robinson, who was described at the time as Poor Law Commissioner and schoolmaster (when Vason was at the charity school). On the other hand, Mrs. J. Morgan remembers that her father, Mr. R.H. Bradley, once told her that a room at the back of their family home (now occupied by Mr. R.P. Stammers) had been a schoolroom in the charge of a Mr. Robinson. Then the cottage where Miss Fiona Stewart lives, in the grounds of Winthorpe House, appears to have been a Dame School. Whether these schools were in addition to the charity school and take care of the gap between 1867 when the Hall property was dispersed, and 1877-78 when the present school was built, it seems difficult to find out. There are some missing pieces in the jigsaw which may yet come to light. 1861 - 67 or longer. James Alien, Mrs. Alien. 1897 Miss Turner, Miss Moss. 1901 Mela Fisher - head teacher, Miss Nellie Broadberry - assistant. 1903 Miss Batho - head teacher. 1906 Miss Maggie Walker - assistant. 1907 Alice Thaine - head teacher. 1910 Miss Harrison - assistant. 1911 Miss Deverall - assistant. 1912 Alice Roberts - head teacher. 1949-66 Mrs. Parkinson - assistant. 1961 - 67 Mr. R.K. Ellis - head teacher. 1966-70 Mrs. M. Davies - assistant. 1967 - Mr. J.A. Smith - head teacher. 1971 - Mrs. B.R. Brown - assistant. This list is incomplete. There were temporary appointments, which we have not always recorded, and we have left out the names of "monitresses" or pupil-teachers. 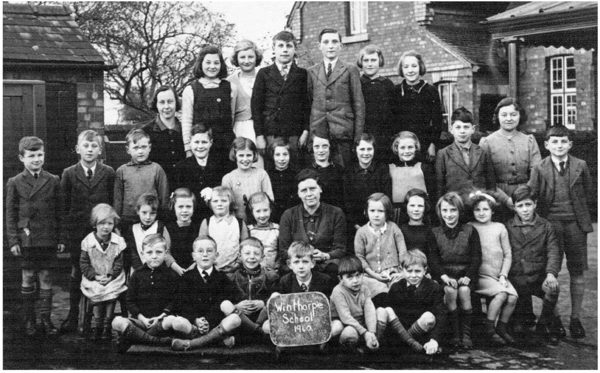 Winthorpe County Primary School 1971 - 2006 in Volume 3. Winthorpe County Primary School Centenary Booklet 1879 - 1979 in Volume 3. Winthorpe County Primary School P.T.A. in Volume 3.